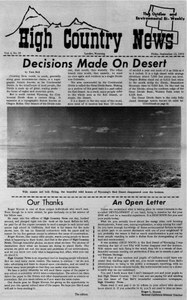 The Bureau of Land Management has pleased conservationists by enacting management policies that will protect many of the natural resources of Wyoming's Red Desert, a unique geologic area. A neo-sociobioecological study of the grizzly bear! I always wanted to do one of those new-fangled scientific studies on something. So, the adventurous side of my psyche asked, "why not do the grizzly bear?" The North Central Power Project proposed for northeast Wyoming and southeast Montana has been put into some perspective by scientists of the Environmental Defense Fund. The implications are staggering.